ILLEGAL animal traps have been condemned by the RSPCA after an incident in Potters Bar caused a fox to be put down. Rescue officers were called to Coopers Lane last Thursday, when sickened staff from Wood Green Timber Merchants discovered a fox had crawled into a storage shed with a trap attached to its leg. The fox had to be put down because it was in pain and the injuries were so severe. RSPCA animal welfare officer, Kate Cornell, said: “This trap had completely snapped the poor fox’s leg. It was truly horrific. 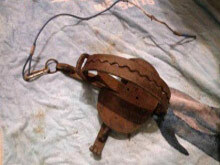 The illegal leg-hold trap which killed the fox was similar to a gin trap, which have been banned in England since 1954. They are designed to catch an animal by clamping its leg inside spring operated jaws with a serrated edge. The sale or possession of such traps is not illegal, but the RSPCA wants to make people aware that they can face prosecution by setting a gin trap. Anyone found guilty of setting a gin trap which causes unnecessary suffering to an animal faces a maximum £20,000 fine and/or six months in prison.